A new report from Motherboard today takes a look into the practices of US wireless carriers selling user location data to third-parties. While it’s often credit card and other financial companies buying the location data for fraud detection and more, Motherboard says some rogue third-parties have access to user location data and it’s landing the hands of bounty hunters and the black market. Update 2/7/19: Motherboard has released a new report that further details the sales of users’ location data over the past several years. While carriers have downplayed the extent to which third-parties like bounty hunters and others have been able to buy users’ location data, documents from one data location seller paints a much more concerning picture. The numbers from one company, CerCareOne, describe selling AT&T, T-Mobile, and Sprint user location data to around 250 bounty hunters and other parties more than 18,000 times over a period of five years. Worse yet, some of the those bounty hunters allegedly resold the data that they obtained to others. Oregon Senator Ron Wyden who has pressed carriers on this issue over the past years shared a statement with Motherboard. Read up on all the new details of this story at Motherboard. It’s well-known that law enforcement and other government agencies can access user location data from wireless carriers with a warrant, Motherboard says there’s a more complicated and dangerous market that involves carriers like AT&T, T-Mobile, and Sprint selling location data to third-party location aggregators. The issue is that there seems to be little oversight when it comes to what these companies can do with the purchased data. The investigation also shows that a wide variety of companies can access cell phone location data, and that the information trickles down from cell phone providers to a wide array of smaller players, who don’t necessarily have the correct safeguards in place to protect that data. Motherboard’s Joseph Cox was able to track the location of a person via their T-Mobile phone number who agreed to be a target for a test. A call to a bounty hunter and $300 did the trick. Notably, this didn’t involve any hacking or background knowledge about the phone number. at least one company, called Microbilt, is selling phone geolocation services with little oversight to a spread of different private industries, ranging from car salesmen and property managers to bail bondsmen and bounty hunters, according to sources familiar with the company’s products and company documents obtained by Motherboard. Complicating this already murky issue is the re-sale of location data on the black market. Compounding that already highly questionable business practice, this spying capability is also being resold to others on the black market who are not licensed by the company to use it, including me, seemingly without Microbilt’s knowledge. It’s this convoluted web of interactions that makes these privacy and security concerns so problematic. It leaves carriers seemingly helpless once the data is in the hands of third-parties. There’s a complex supply chain that shares some of American cell phone users’ most sensitive data, with the telcos potentially being unaware of how the data is being used by the eventual end user, or even whose hands it lands in. As for the carriers, the CTIA (Cellular Telecommunications Industry Association) that represents AT&T, T-Mobile, Sprint, and more said that the transmission of location-based user data is reliant on “two fundamental principles: user notice and consent,” however, Motherboard said its investigation proves that’s not working. Telecom companies and data aggregators that Motherboard spoke to said that they require their clients to get consent from the people they want to track, but it’s clear that this is not always happening. In a call to Microbilt’s customer support, Motherboard found the company sells user location data for as little at $5. 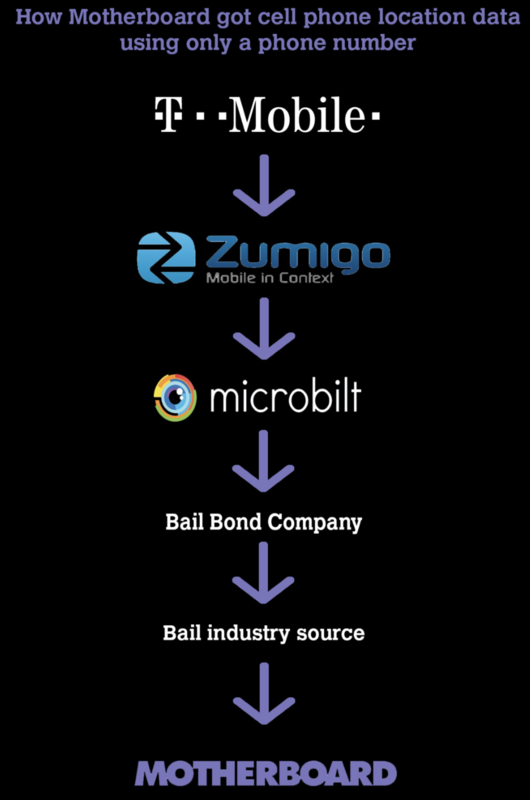 Posing as a potential customer, Motherboard explicitly asked a Microbilt customer support staffer whether the company offered phone geolocation for bail bondsmen. Shortly after, another staffer emailed with a price list—locating a phone can cost as little as $4.95 each if searching for a low number of devices. AT&T responded to Motherboard saying that they have cut ties with Microbilt as they look further into these issues. Sprint does not have a direct relationship with MicroBilt. If we determine that any of our customers do and have violated the terms of our contract, we will take appropriate action based on those findings.” Sprint would not clarify the contours of its relationship with Microbilt. “We take the privacy and security of our customers’ information very seriously and will not tolerate any misuse of our customers’ data,” A T-Mobile spokesperson told Motherboard in an emailed statement. “While T-Mobile does not have a direct relationship with Microbilt, our vendor Zumigo was working with them and has confirmed with us that they have already shut down all transmission of T-Mobile data. Check out the full, in-depth investigative report here.